It's been over 12 years, folks: It's time to let that aging operating system go. In case the insistent cries of all your favorite applications and anyone who's used your computer recently weren't enough indication, we're here to make it totally clear that today is the day Microsoft ends official support for Windows XP. That means no more security updates and no more customer service calls. A paid option is available to organizations (think: governments, corporations, etc.) that offers "critical" patches and support, but even Microsoft suggests upgrading to a newer version of Windows instead of footing the bill. 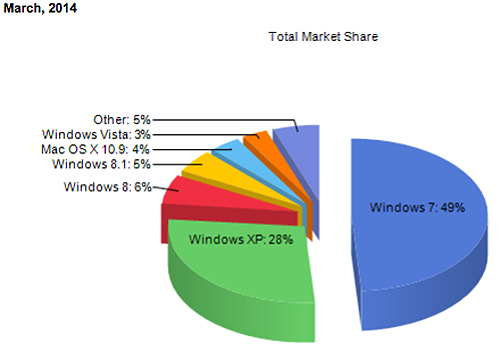 We won't rib you too much for sticking to XP, though; over 25 percent of you are still running Microsoft's 2001 release, according to NetMarketShare. And that's to say nothing of the world's ATMs, 95 percent of which were still running XP as of two weeks ago. Egads! Relax, y'all -- the company in charge of those ATMs, NCR Corporation, says it's in the process of upgrading and (as of last check-in a few weeks ago) should have one-third upgraded ahead of... today. After speaking with a rep this afternoon, however, the company is updating its upgrade estimate to "less than 20 percent." Not exactly a thrilling prospect when it comes to safety, though many banks are ponying up to Microsoft for ongoing updates. A variety of countries are also still dependent on XP for governmental affairs, such as the United Kingdom and the Netherlands, both of which had to work out paid measures with Microsoft for continued security support. China's population is largely dependent on XP as well, with nearly half of the country's computer users running the aged OS. Still, between years of warning, financial incentives to upgrade and an update to XP that outright told users of today's news, it's hard to be upset at Microsoft. There was even free software for migrating content over. So today we say goodbye to Windows XP: You were there for us back before the internet was cool, and you set the standard for desktop OSes.